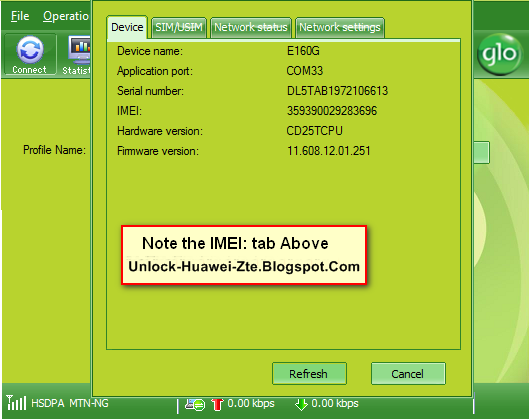 Today I am write here is a simple tutorial steps on how to check your huawei and 3G WiFi / MiFi router imei number(s). You may want to unlock your 3G WiFi / MiFi router only for you to find out that the imei number engraved on the body of the modem has cleaned off.Or because you can no longer have access to the cartoon wrapper of the modem. From my own experience frequent handling and usage of your WiFi / MiFi router modem can get the write ups on the body of the modem cleaned of. Step 1:- Plug in your USB modem to your PC usb port and wait for its to initial detecting and registering a network. Step 2:- First Select Huawei tab & Enter your modem IMEI number in IMEI box. Step 3:- Click on Calculate button.